Every day, researchers are producing more evidence on the agriculture-nutrition nexus; professionals are stepping out of silos to work across sectors; and people and institutions are improving their capacity to carry out this work. The momentum built during the past decade has created boundless opportunities for redesigning and reimagining agricultural and food systems for the benefit of nutrition. 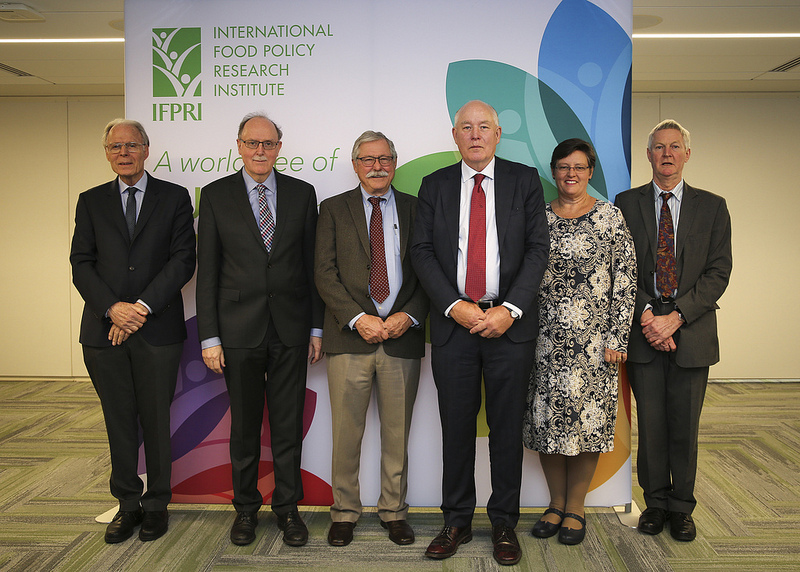 This event marks the publication of Agriculture for Improved Nutrition: Seizing the Momentum, co-edited by Shenggen Fan, Sivan Yosef, and Rajul Pandya-Lorch. The volume reviews the latest evidence, results from on-the-ground interventions, and recent national policy experiences of bringing agriculture and nutrition closer together. Panelists will discuss big data, the design of agriculture-nutrition programming, the global obesity epidemic, and India’s and Malawi’s successes and challenges in linking agriculture to nutrition. 26 February 2019. BIOMIN and Romer Labs hosted live webinar featuring an in-depth discussion on upcoming mycotoxin threats to poultry, swine and ruminants worldwide, the latest annual results of the BIOMIN Mycotoxin Survey, the outlook for 2019 and relevant mycotoxin detection tools to better understand and control the risk of contamination in raw materials and feed. 27 February 2019. Brussels. 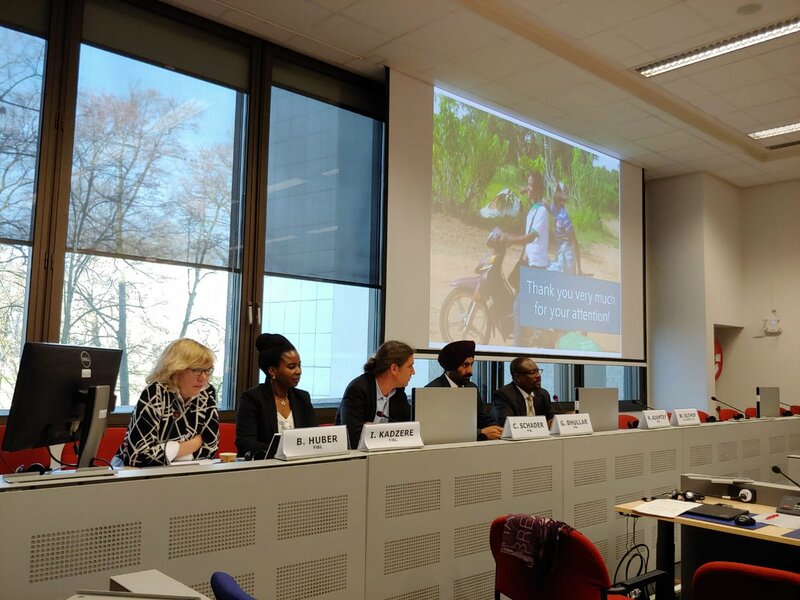 ”Sustainable agriculture: where are we on SDGs implementation?” The Briefing was co-organised by CTA, the European Commission (DG Devco), the ACP Secretariat and CONCORD. This panel provided an overview on SDGs, and more especially SDG 2, and bring various perspectives from policy, research and the private sector. Panel 2: Best practices towards successful SDGs implementation. 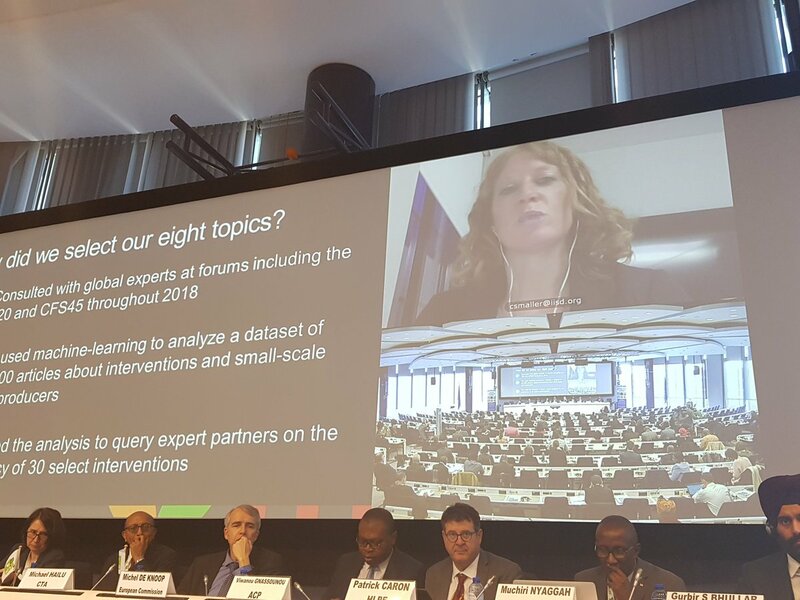 This panel looked at specific examples of successful delivery of initiatives and programmes in support of SDG2. Led by the Research Institute of Organic Agriculture (FiBL), the workshop was hosted by the European Commission. 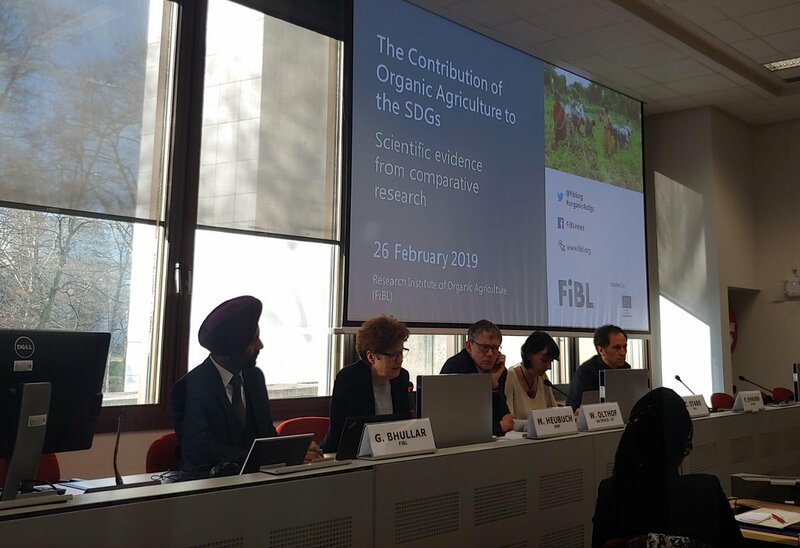 It aimed to stimulate debate on the role of organic agriculture and other agro-ecological approaches in the European and international development policy frameworks in the context of the 2030 Agenda for Sustainable Development. 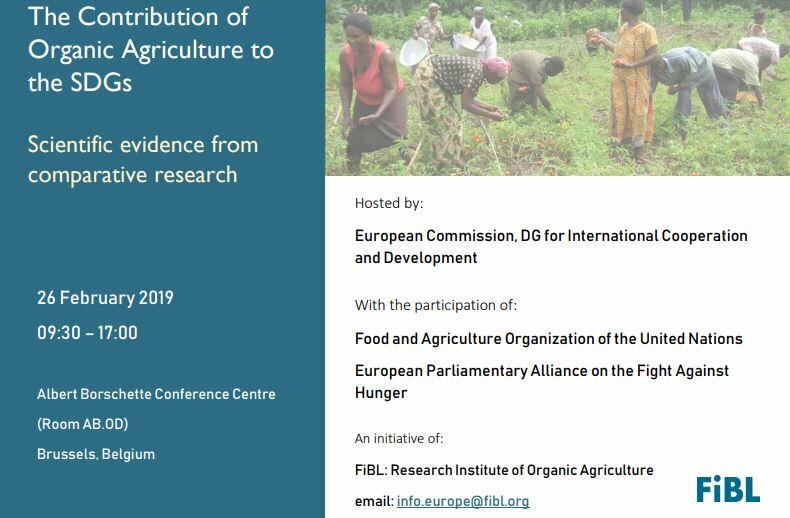 Presentations on the latest scientific evidence produced by FiBL researchers on the performance of organic agriculture in tropical and sub-tropical climate zones in terms of productivity, economic viability, environmental soundness and social inclusiveness. A scientific panel discussion with representatives from leading research institutes. 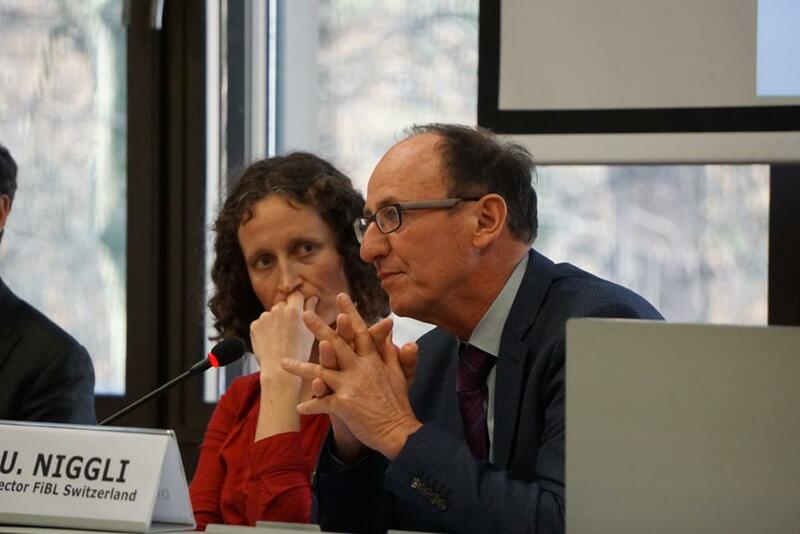 A policy panel discussion with representatives from the European Commission, the Food and Agriculture Organization of the United Nations, and the European Parliamentary Alliance on the Fight Against Hunger. Results of 10-year farming systems comparisons in Kenya, India and Bolivia. Results of 5-year assessments on productivity, profitability and sustainability in Ghana, Kenya and Uganda. Policy Reflection Panel Discussion: The role of organic agriculture and other agroecological approaches in development policy. Agroecology represents an alternative paradigm for food and farming – one that puts people and planet at centre stage and emphasises the priorities of food producers and marginalized peoples around the world. International institutions can play an important role in advancing this paradigm, as this new bookletdemonstrates. The publication is the first of a new series of civil society briefings. It provides strategic advice to civil society groups for influencing global policy-making on food to support agroecology while avoiding co-optation. Written by Janneke Bruil, Colin Anderson, Annelie Bernhart and Michel Pimbert. This work is supported by the Centre for Agroecology, Water and Resilience of Coventry University (CAWR) and the Agroecology Fund and was developed in collaboration with Cultivate!, an international collective that catalyzes the transition to healthy food and farming rooted in agroecology. The brief is published as a part of the Reclaiming Diversity and Citizenship Series hosted by the Centre for Agroecology, Water and Resilience at Coventry University. Dans le cadre de la conférence à l'Innovation Center de Bayer (Lyon), Jacques Wery a présenté sa vision de l'agro-écologie et la place réservée aux pesticides. Cette deuxième partie est consacrée à la place des pesticides. describe the range of modern tools contributing to the geographic mapping and analysis of the Earth and human societies. Especially in the last decade, these technologies have evolved into a network of national security, scientific, and commercially operated satellites complemented by powerful desktop GIS. High quality hardware and data is now available to new audiences such as universities, corporations, and non-governmental organizations. The fields and sectors deploying these technologies are currently growing at a rapid pace, informing decision makers on topics such as industrial engineering, biodiversity conservation, forest fire suppression, agricultural monitoring, humanitarian relief, and much more. Geospatial technology is used mostly for surveying and mapping of plantation crops. At the micro level implementation of geospatial tools is mainly used for mapping of ground water resources, drainage patterns, variable rate application and management of fertilizers, pesticides and insecticides. Geospatial technologies play an influential role in the agriculture sector by increasing yields, managing of resources, prediction of outcomes and improving farm practices. 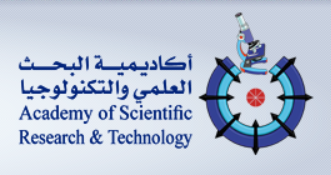 A course organised by ICARDA for young scientists provided an overview on Geospatial Science, Technology and Applications in Agriculture. Key components of the course included lectures, discussions, interactive and hands-on computer exercises, and individual projects. to learn the general image processing and GIS operation to extract and manage spatial information. The participants came from Iraq (*3), Tunisia, Egypt and South Africa. 3 participants form Iraqm Tunesia and SouthAfrica/Zimbabwe were asked how this course would benefit their work back home. Chandrashekhar Biradar (ICARDA) co-authored a paper on the mapping of annual cropland in Central Asia. Published in the Remote Sensing journal, the study used a reference time-series-based mapping method (RBM) to create binary cropland vs. non-cropland maps using irregular Landsat time series. This method was applied in seven distinct agricultural landscapes in Xinjiang, China, and the Aral Sea Basin. The authors found that the accuracy of this study was higher than 85% and also significantly more accurate than existing products, such as GLC30 and FROM–GLC. Wheat is an important strategic food security crop in Africa, where billions of dollars are spent on imports although there is a great potential to produce the crop locally. 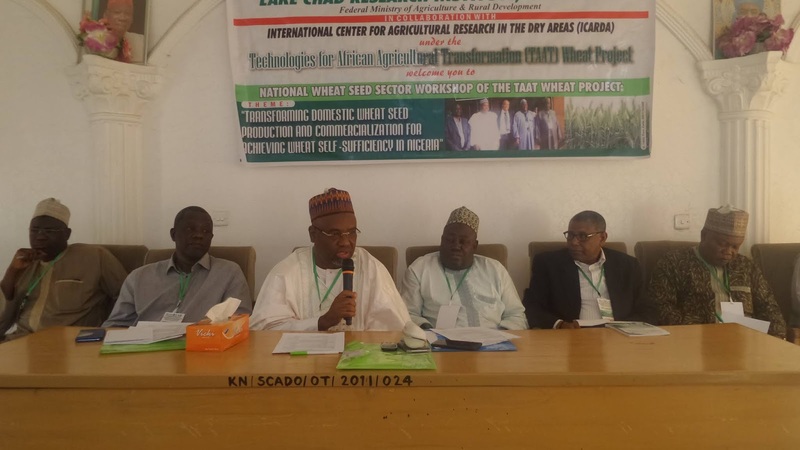 The African Development Bank (AfDB), bolstered by the successes of the Support for Agricultural Research and Development of Strategic Crops (SARD-SC) projects, started a new initiative – TAAT. (Technologies for African Agricultural Transformation). The TAAT programme consists of nine value chains (rice, cassava, wheat, sorghum/millet, maize, high iron beans, orange-fleshed sweet potato, small livestock and aquaculture) and six enabler/cross-cutting (policy, capacity building, ENABLE-TAAT, water management, and fall armyworm) compacts. 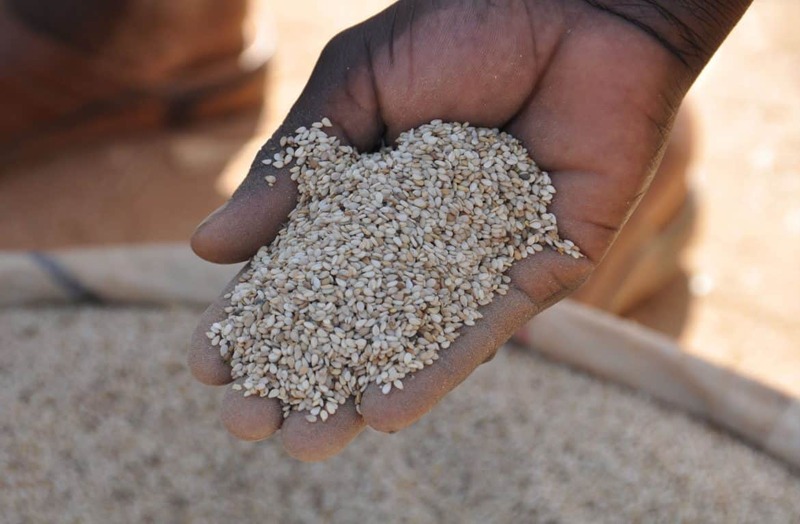 In the TAAT Wheat Project project, transforming wheat production is at the forefront of the Feed Africa agenda of the the African Development Bank AfDB to ensure self-sufficiency of the continent. ICARDA is implementing the TAAT Wheat Project. The project focuses on seven countries in sub-Saharan Africa (Ethiopia, Kenya, Mali, Nigeria, Sudan, Tanzania, and Zimbabwe) and seeks to transform domestic wheat production and commercialization to achieve wheat selfsufficiency in target countries. 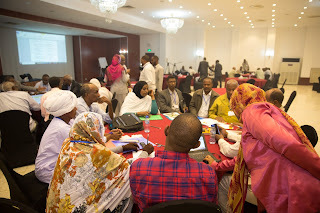 28–30 October 2018 in Khartoum, Sudan. The launch of the TAAT Wheat Project and the National Wheat Seed Sector Consultation Workshop. In Sudan, wheat was traditionally grown for thousands of years as a staple crop in the northern part of the country where temperatures are low. However, increased demand arising from an increased population and urbanization pushed wheat production towards the southern states with their shorter, hotter winters. The availability of heat-tolerant varieties boosted wheat production to a level of 90% self-sufficiency in the 1990s. However, inconsistent government policies led to a decline in self-sufficiency; at its lowest it was just 20%. With SARD-SC intervention, however, wheat self-sufficiency reached about 36% in the 2015/16 crop season. Local production reached about 780,000 tonnes compared to a total national consumption of 2 million tonnes. 28–29 November 2018 in Kano, Nigeria. The National Wheat Seed Sector Consultation Workshop 16 October 2018. Abuja, Nigeria. Project launch meeting. In Nigeria, as elsewhere in sub-Saharan Africa, wheat is becoming a strategic staple food crop – a result of increased demand arising from an increased population and urbanization and changing food habits. Nigeria has both irrigated and rainfed wheat production conditions. 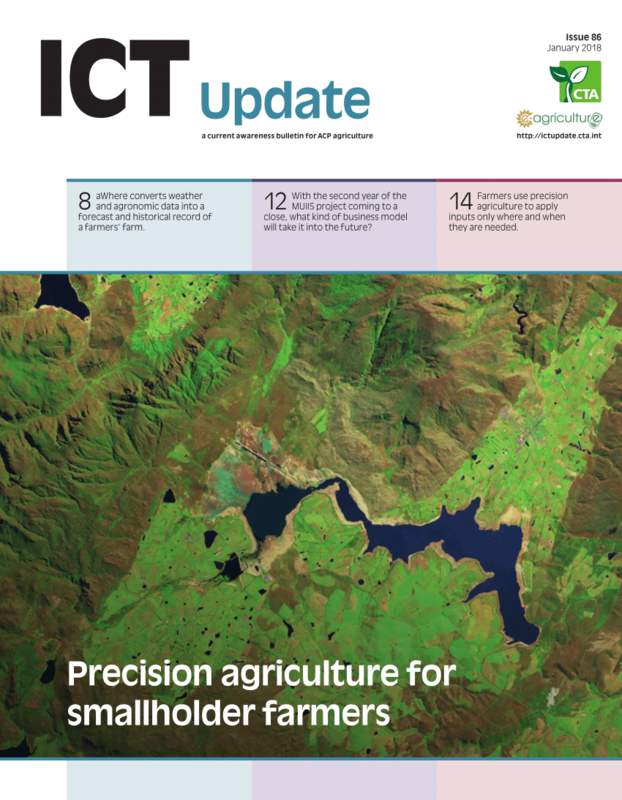 Commercial production usually takes place under Seed Info January 2019 | Issue No. 56 6 irrigation between latitudes 10°N and 14°N during the dry Harmattan season (November–March). The availability of heat-tolerant varieties had enabled wheat production to reach 90% in the 1990s. The wheat production level in Nigeria has been very low. 26 February 2019. IFPRI Egypt Seminar in partnership with the National Nutrition Committee (ASRT). "100 million healthy lives: Scientific evidence on double burden of malnutrition in Egypt"
The seminar discussed the current status of malnutrition among children and adults; providing a policy framework for managing determinants of malnutrition and obesity; and identifying options for preventive action to reduce the costs of nutrition-related diseases. 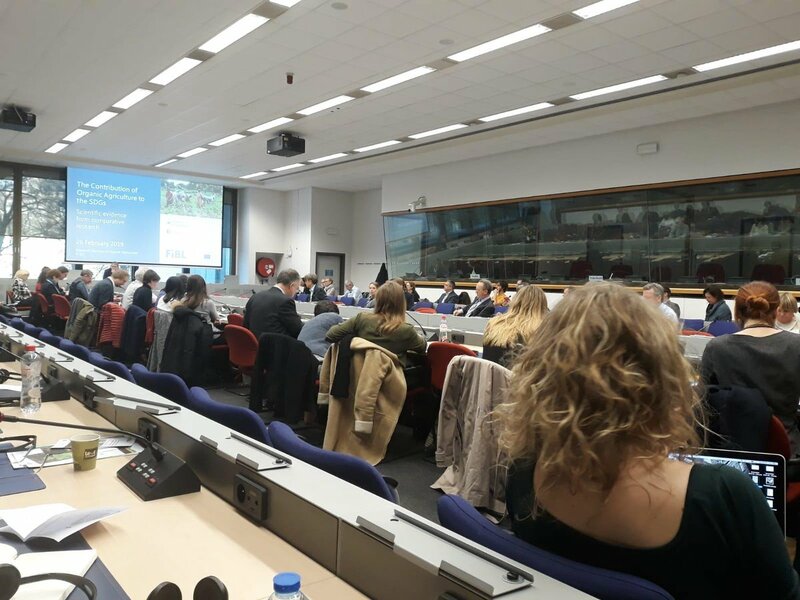 In that respect, the seminar provided the occasion for researchers, decision makers and other stakeholders to discuss and inform the 100 Million Healthy Lives Initiative on state-of-the art nutrition and health related policies and interventions. Presentations took stock of the available nutrition data and provide an overview of the latest nutrition research findings from IFPRI and CAPMAS. The seminar also presented a multidimensional framework to control obesity and non-communicable diseases developed by Egypt’s National Nutrition Committee. experience contributed to the identification of priority programs and key policy interventions, providing guidance on the way forward for the 100 Million Healthy Lives initiative to achieve its health and nutrition targets. "The share of Egyptian adults who are overweight or obese is among the highest in the world. Shifting diets from cheap but calorie-rich foods such as bread and sugary foods toward more fruit, vegetables, meat, and fish could contribute to healthier and more productive lives and improve children’s physical and mental development. Both the quantitative and qualitative analyses showed that Takaful produced a greater increase in food spending than in nonfood spending, with households spending more on fruit, meat, and poultry." 20 December 2018. Cairo. IFPRI. “Advancing the food system for growth, job creation and better nutrition in Egypt”. This seminar presented first estimates on how the key value chains in Egypt - such as cereals, fruits, vegetables, livestock and fish contribute to key development indicators. The presentation of results were accompanied by presentations of a distinguished set of panelists. 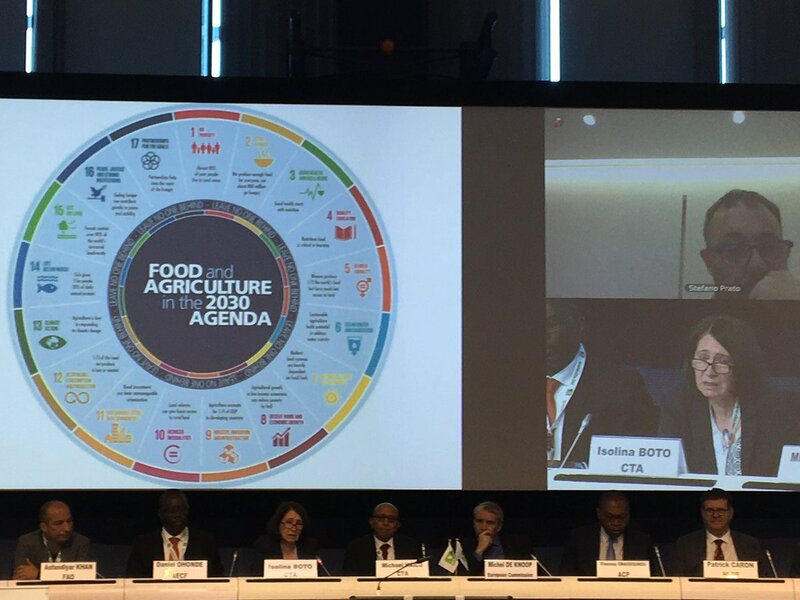 As such, the seminar uncovered trade-offs between promoting different value chains and thereby help guiding public and private investments in the food system. Biodiversity for food security and nutrition. 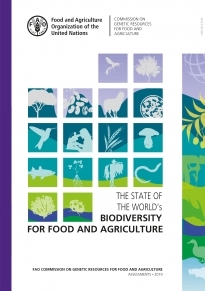 The first report on “The State of the World’s Biodiversity for Food and Agriculture” is an essential step in creating a comprehensive picture of the state and use of this biodiversity, thus providing a strong foundation for the design of effective interventions towards more sustainable, resilient food systems. Five years in the making, the report engaged over 175 authors and reviewers, who based their analysis on 91 country reports prepared by over 1,300 contributors. This global and participatory report is a milestone in the United Nations Decade on Biodiversity. The report prepared under the guidance of FAO’s Commission on Genetic Resources for Food and Agriculture details the many benefits biodiversity brings to food and agriculture; examines how farmers, pastoralists, forest dwellers and fisherfolk have shaped and maintained biodiversity; identifies major drivers of both positive and negative trends, and presents trends in biodiversity-friendly production practices. Mechanization of African Agriculture - Does it Create or Destroy Jobs? 20 February 2019. Berlin, Germany. Mechanization of African Agriculture - Does it Create or Destroy Jobs? 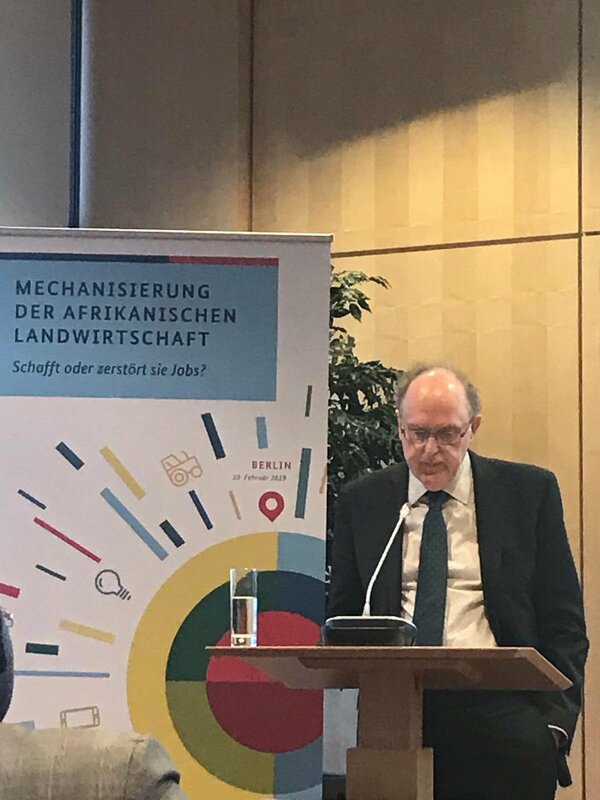 Launch of the german version of the MaMo Mechanized Report. 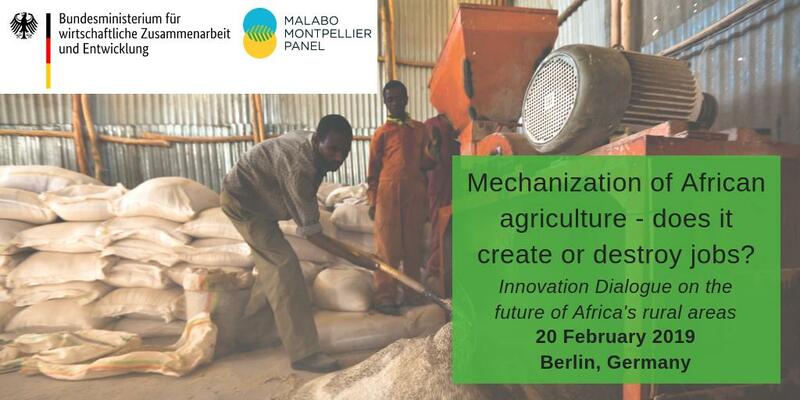 A study by the "Malabo Montpellier Panel" describes the state of mechanization of agriculture in Africa. The panel provides recommendations for institutional reforms, innovative sector policies and cooperation with the private sector. 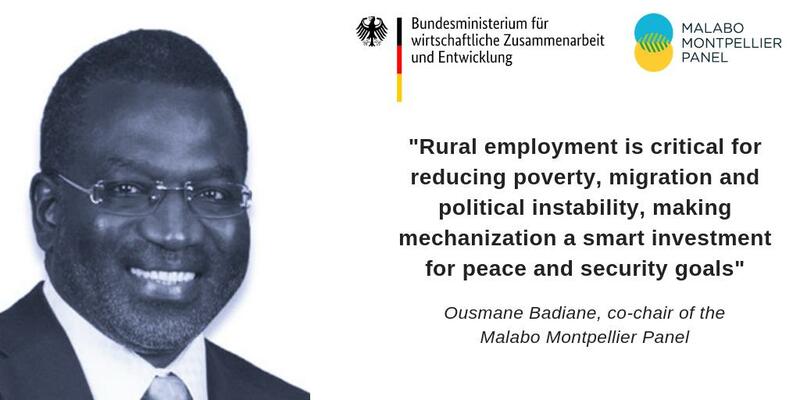 The study testifies to considerable increases in productivity by agricultural machinery and shows: Mechanization can certainly lead to more employment. How and under what conditions does this work in smallholder African agriculture? What possibilities does an inter-company use offer? Joachim von Braun, University of Bonn. The report — Mechanized: Transforming Africa’s Agriculture Value Chains (55 pages) —summarizes the findings of a systematic analysis of what countries at the forefront of progress in mechanization have done right. It analyzes which policy decisions were taken and which interventions were implemented to substantially increase the uptake of mechanization. 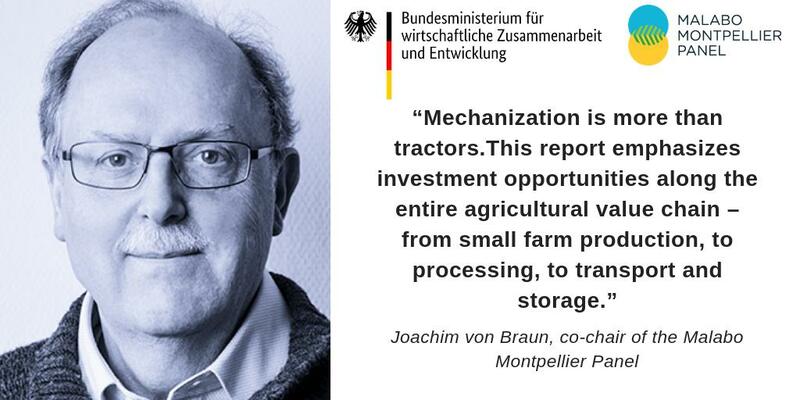 The report takes a broad perspective on mechanization, including technologies along the entire value chain and how they relate to agricultural development and job creation. The report shows what can be done to sustainably mechanize agriculture to increase production and enhance value addition across value chain segments. The set of policies and practices that are identified, if brought to scale, could have significant impact on agricultural transformation in Africa. The report provides a roadmap for African governments to take concerted action to deliver on the growth and transformation targets set out by the Malabo Declaration and the Sustainable Development Goals. This event co-organised by the African Development Bank (AfDB) and the Malabo Montpellier Panel in Abidjan, Côte d'ivoire, will cover the thematic areas covered under the Panel’s first three reports and bring together members of the Panel to present the key findings and recommendations, and to exchange with the experts at the AfDB. They will also discuss the way forward regarding the appropriation of the outcome of the reports by policy makers and planners in order to inform policy reforms and investments to be supported by the Bank and other Development Partners. Particularly, the discussion will focus on the communication approach followed by the Panel so far and identifies possible improvement if necessary. Finally, during the event some insights on priority topics for future reports by the Panel will be discussed. Since January 2017, the Malabo Montpellier Panel has published three reports. and Water-Wise: Smart Irrigation Strategies for Africa (December 2018). The thematic areas covered under these reports tie in closely with the AfDB’s Hi 5 Agenda. FAO and ECA. 2018. Regional Overview of Food Security and Nutrition. Addressing the threat from climate variability and extremes for food security and nutrition. Accra. 116 pp. The incidence of hunger continues to increase in Africa after several years of decrease, threatening the various efforts to eradicate hunger to meet the Malabo Goals 2025 and the 2030 Agenda for Sustainable Development, specifically the Sustainable Development Goal 2. This was highlighted in the report Africa Regional Overview of Food Security and Nutritionreleased by the Food and Agriculture Organization of the United Nations and the United Nations Economic Commission for Africa. The report states that 237 million people in sub-Saharan Africa are suffering from chronic malnutrition, overturning the improvements accomplished in the previous years. Eastern Africa, many countries suffered from drought," FAO Assistant Director-General and Regional Representative for Africa, Abebe Haile-Gabriel, and ECA Executive Secretary Vera Songwe. Download the report from the FAO website. (...) After a historic court ruling in August in which the agrochemical conglomerate was forced to pay $78 million for “acting with malice” in concealing the carcinogenic risk of its product, resulting in a California groundskeeper’s cancer, Bayer-Monsanto is facing over 9,300 additional lawsuits from others with non-Hodgkins lymphoma who believe Roundup was responsible. The next case begins later this month. News stories have exploded recently — as they do every 3 months or so — screaming that glyphosate is a cancer-causing evil that causes a 41% increase in people who are exposed to the chemical. After decades of research, we can safely say that glyphosate is not harmful to the average person. Despite the recent research, it’s unlikely that glyphosate poses any significant harm. So where are the terrifying headlines coming from? Well, researchers recently did what’s known as a meta-analysis to look at glyphosate risk for a specific type of cancer — Non-Hodgkin’s Lymphoma. What this means is that they combined all of the studies that have been done looking at this specific cancer, and reanalyzed the data to see if there was a risk. They found that being exposed to the highest levels of glyphosate for long periods of time was associated with a 41% increased risk of developing the cancer. The problem is, this study had issues. It collected a diverse range of observational studies into one place, and then combined the results into one statistical analysis. To see the problem with combining studies in this way, we can take a look at two of the included studies — one of them measured glyphosate exposure via a single yes/no question, while the other used a detailed interview that looked at a wide variety of exposures. Are those two studies measuring the same thing? It’s hard to know. Overall, even if we accept the results on face value, the study isn’t that meaningful to individuals. The increased risk, in absolute terms, was only about 0.5%, which is much lower than the scary-sounding 41% that’s been in most headlines. It was also for people who have been exposed to very high levels of glyphosate, often for decades. This is very different to the tiny exposure that most people would get from eating fruit and vegetables grown using glyphosate. Related: Glyphosate : comment s'en sortir? This will be WEB streamed. Biovision (Switzerland) has recently launched a new website “Agroecology Info Pool” which contains a criteria tool to assess projects or policies, convincing showcases and an assessment of the impacts of various agroecological interventions on all Sustainable Development Goals. The website serves as a platform to provide evidence, knowledge and experiences on the impacts and multiple benefits of Agroecology. 26 November 2018.L’agriculture de conservation au Maghreb. Les agriculteurs font évoluer leurs pratiques. Trade is an important avenue through which countries transform their economies and raise standards of living. For African countries, trade in agricultural products offers great potential to boost incomes for farmers, processors and other agricultural value chain actors. "Increasing the ability of African countries to participate in regional and global trade helps to improve well-being of consumers, raise incomes of farmers, build resilience of food markets, and ultimately it also helps to boost economic growth and reduce poverty,"
"Increasing the ability of African countries to participate in regional and global trade helps to improve well-being of consumers, raise incomes of farmers, build resilience of food markets, and ultimately it also helps to boost economic growth and reduce poverty," Ousmane Badiane, IFPRI Africa Director. 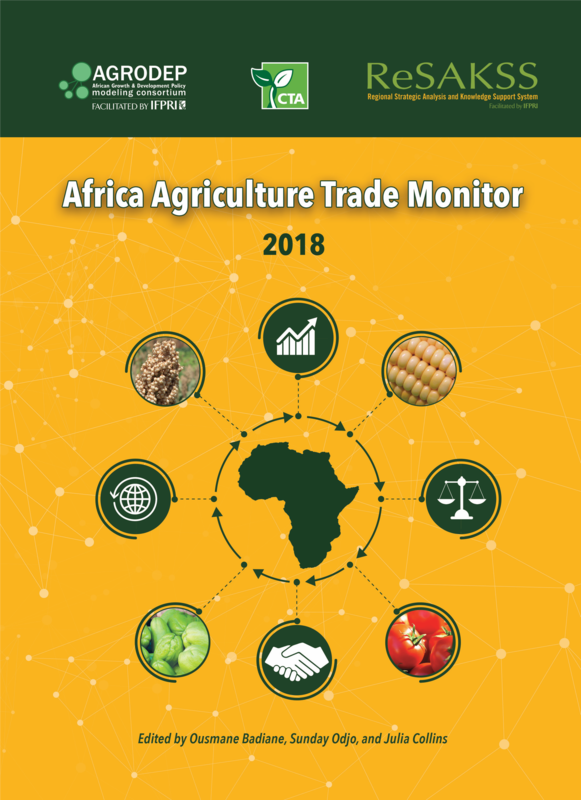 The 2018 Africa Agriculture Trade Monitor (AATM), (2018, 174 pages) is the first in a series of annual reports assesses long-term and emerging trends and drivers of Africa’s global, intra-Africa, and intra-regional economic community trade in agricultural products. It examines Africa’s recent performance in different markets and identifies changes in the composition and direction of trade. The Report is a collaboration between the International Food Policy Research Institute (IFPRI) and the Technical Centre for Agricultural and Rural Cooperation (CTA). It builds on the work of the Regional Strategic Analysis and Knowledge Support System (ReSAKSS) and the African Growth and Development Policy Modelling Consortium (AGRODEP) on trade, both facilitated by IFPRI under its work in support of the African Union Commission’s Comprehensive Africa Agriculture Development Programme. 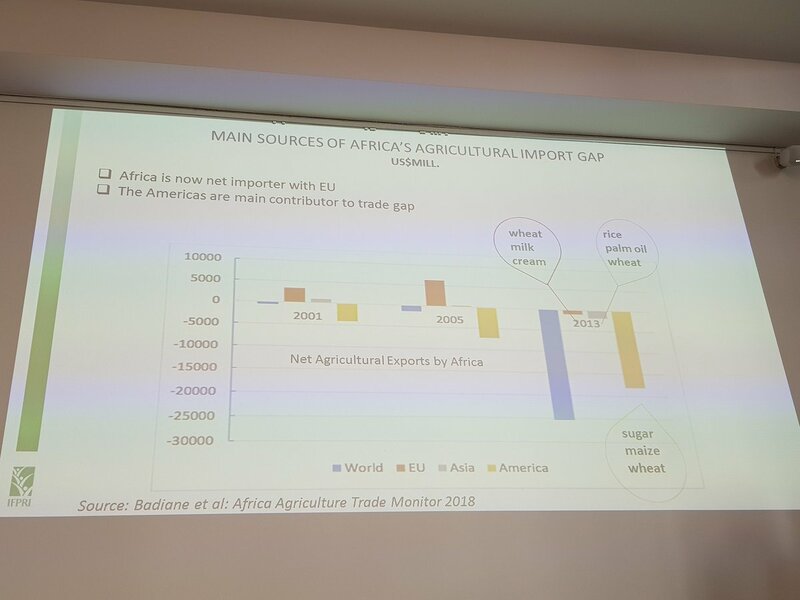 Despite recent growth in agricultural trade deficits, there are promising signs of export diversification, both in commodities traded and trade partners, as well as increasing intra-African trade in agricultural commodities. There is a need for governments to act to raise productivity along the value chain, reduce trade costs, and eliminate barriers to trade in order to boost both global and intra-regional trade. Tthe European Union as the continent’s dominant trading partner, accounting for 40% of exports and 30% of imports, but Asia is catching up rapidly. There are promising signs for export performance from many countries, with African exporters increasing their competitiveness in global markets for three-quarters of commodities studied. Many new export commodities, such as wool, soybeans, soybean oil, live trees and plants, and cocoa preparations, showed strong gains in competitiveness, suggesting the potential for diversifying exports by expanding trade in these areas. In nearly all West African countries national production was more volatile than regional production during the 1980–2010 period, implying that intra-regional trade would be able to reduce the volatility of food supplies at the regional level. Increasing the volumes of intra-African trade in agricultural products has the potential to boost industrialization and enhance competitiveness. 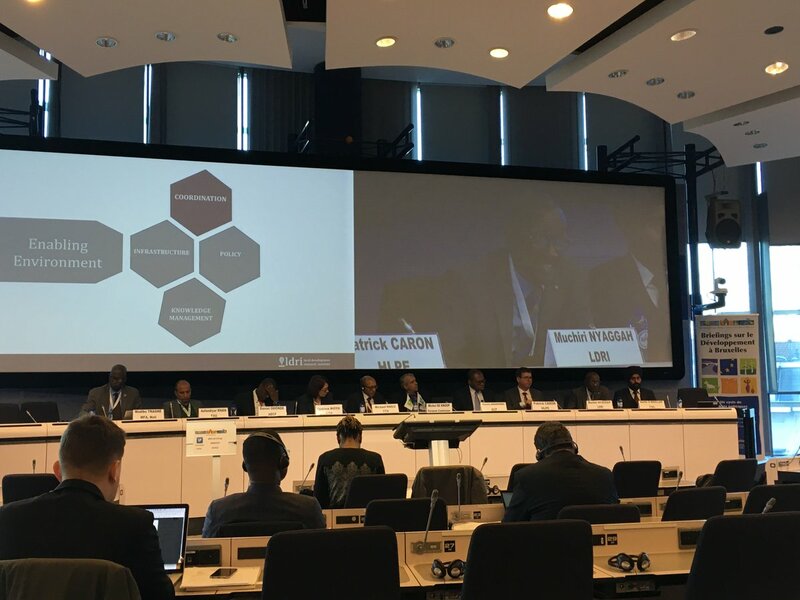 Enabling policies that enhance intra-regional trade such as the Continental Free Trade Area (CFTA) will be crucial to open up the continent to new investors and better opportunities for its entrepreneurs. the poor quality of physical infrastructure, inefficient customs processes and high harassment costs, inconsistent regional standards and regulations, and non-tariff trade barriers including stringent food safety and traceability requirements in importing countries. Support to domestic agricultural producers in OECD countries also reduces Africa’s trade. African countries have limited control over trade policy in other countries, the study notes, but they should continue to take part in global efforts to lower trade barriers. In addition, much can be accomplished by addressing the domestic constraints to expanding trade. and providing an enabling environment for value chain development by strengthening market institutions and investing in infrastructure. At the global level, efforts are needed to meet strict food safety and traceability requirements. 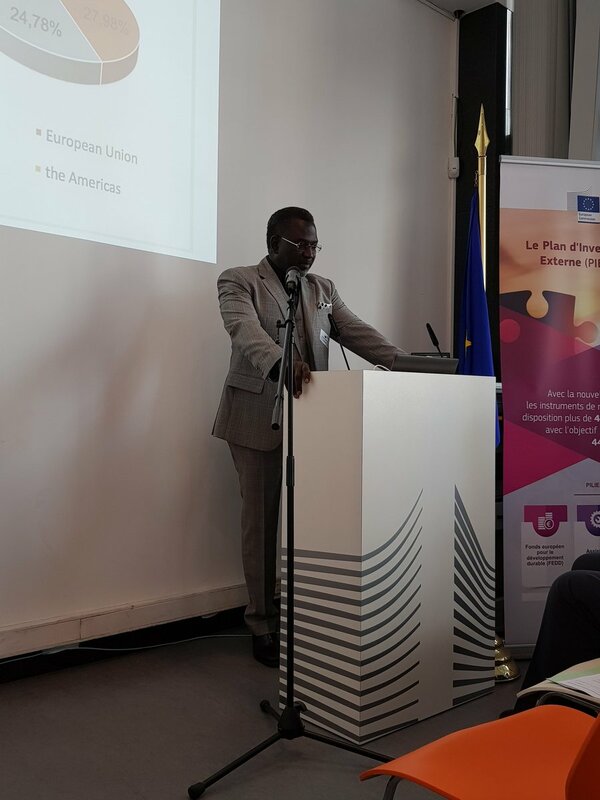 This seminar provided details on the scope and priorities of the IAP project, the regional perspectives of participants, and a global synthesis. During the discussion, participants explores mutual interests in increasing the sciences’ contribution to informed policy development, innovation, and practice. 14-15 February 2019. 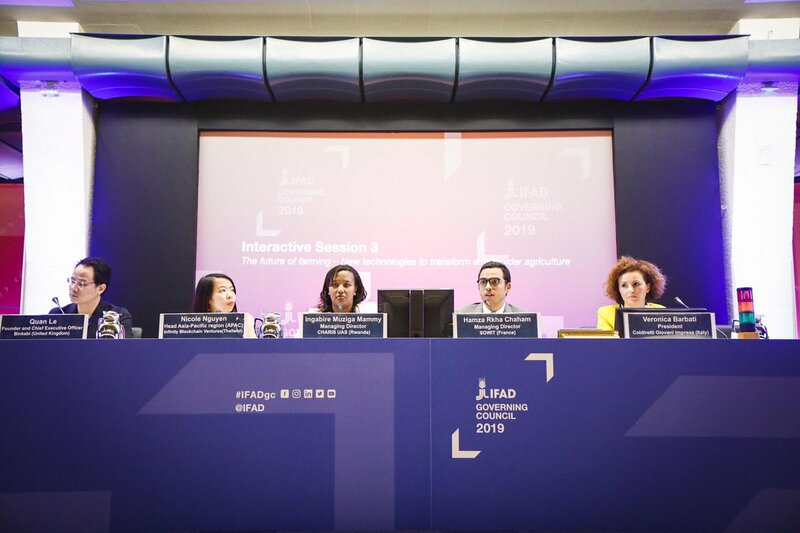 IFAD's forty-second session focused on the theme rural innovation and entrepreneurship. IFAD, with its specialized mandate of enabling rural transformation, has a pivotal role to play in creating the conditions for innovation and entrepreneurship to thrive in rural areas. Moderator: Ms Hlami Ngwenya, Special Facilitator, Emerging Ag Inc.
15 February 2019. European development commissioner Neven Mimica launched the new Agri-Business Capital Fund, or ABC Fund, a partnership between the EU and others who have so far committed around €55 million to support direct investments via small-scale loans for small- and medium-sized businesses and farmers' organizations, plus indirect investment in local financial institutions for on-lending. 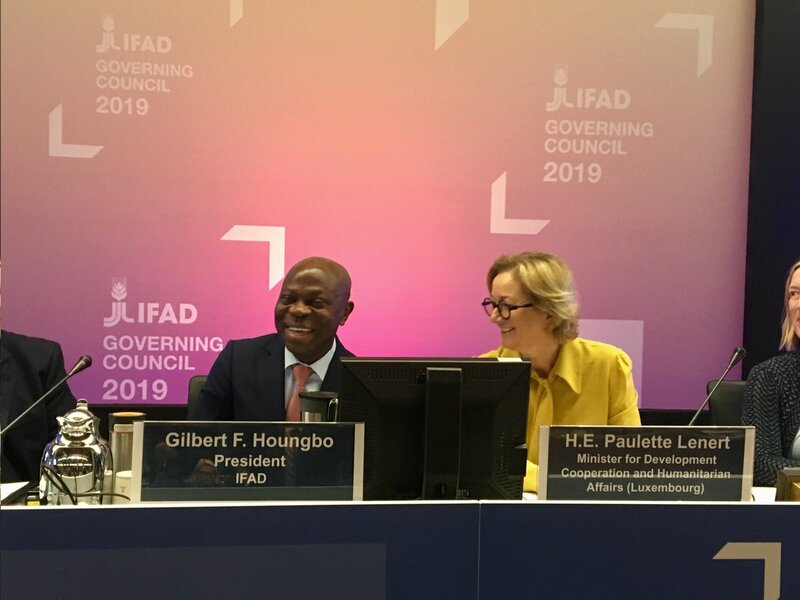 The new ABC Fund, established by IFAD, is primarily geared towards individual smallholders and farmers' organisations, with loan sizes from $25 000 - $1 million (approximately €22 000 – €885 000), thus improving their access to finance. This "missing middle" has the potential to be profitable and to impact development, but has lacked sufficient funding until now. It covers direct investments such as small-scale loans for small and medium-sized enterprises, farmers' organisations and 'agripreneurs', along with indirect investment in local financial institutions for subsequent on-lending. 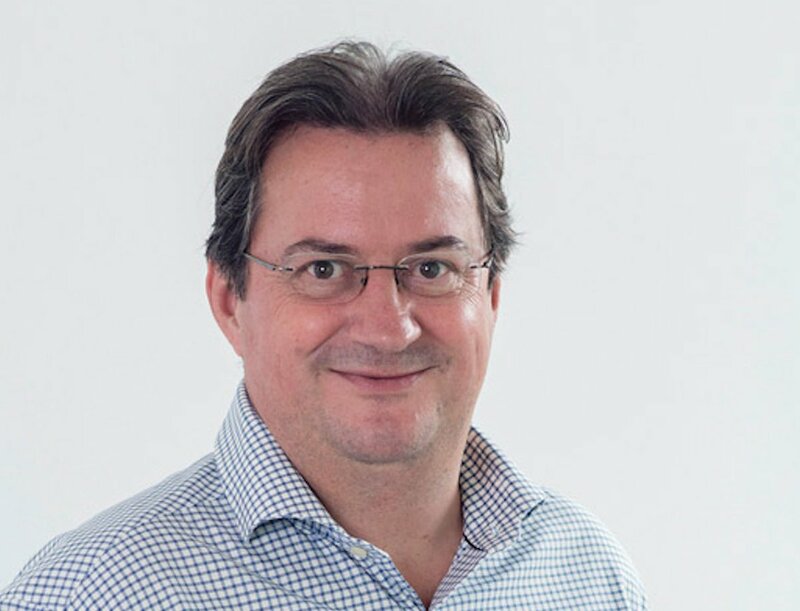 Based in Luxembourg, it draws on the expertise of a professional fund manager and uses technical assistance adapted to investees' needs. Building on past experience, the ACP Farmers' Organisations Programme will strengthen farmers' organisations and cooperatives so that they can increasingly access capital directly, for the benefit of their members. 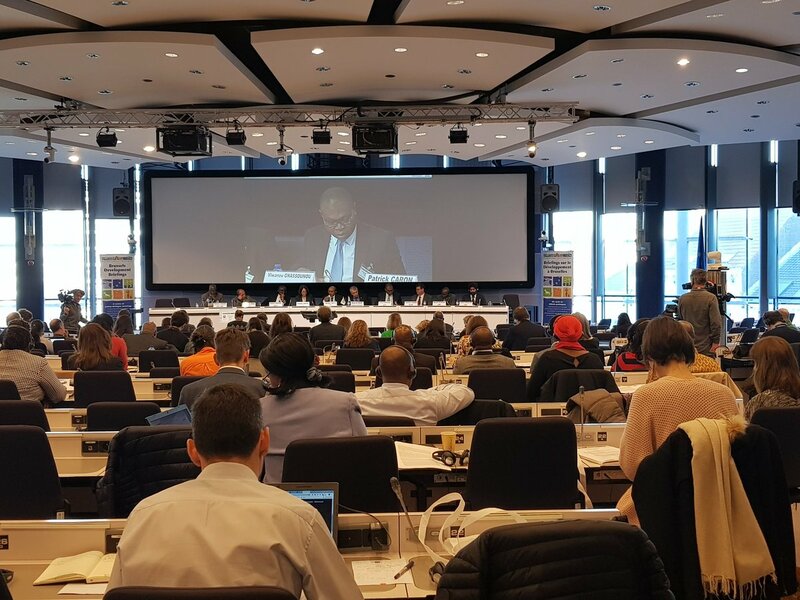 In this way they will become a key element in the supply of bankable deals for the ABC Fund and form another angle of the sustainable investment the EU is seeking to promote. 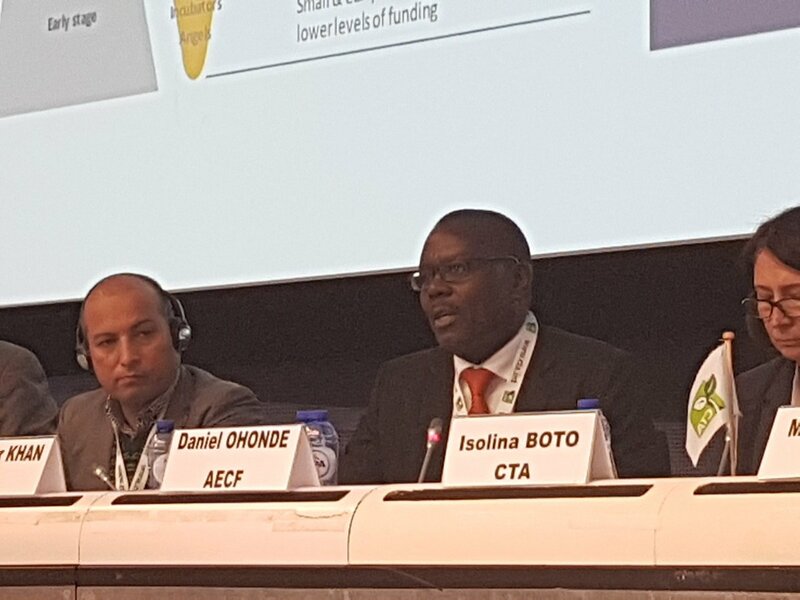 Dr Patrick I. Gomes, Secretary-General @PressACP tells us how the new #ABCfund can improve access to finance for smallholder farmers.